Napali Coast is on the western side of Kauai and is absolutely spectacular. We boarded the Alaikola–a catamaran named after a bird thought to be extinct in the rain forests of the island. Captain Pat and his crew ably guided us over flat waters–we were ‘snailing’ for the entire voyage–the sail was hoisted for a short time for photo opps only. Wave action was nearly non-existent rendering sea-sickness remedies unnecessary. I had on those pressure point bands–so I’m not sure they work as it wasn’t a good test of their effectiveness. History of this island includes the landing of Captain Cook in Waimea, sugar cane and sugar mills and the growing of corn by MonteSanto. Barking Sands includes a missile base and an atomic clock–one of the seven in the world. Further up the coast is the Napali Coast State Park with waterfalls, sea caves, and towering cliffs covered with vegetation and shrouded in mists. 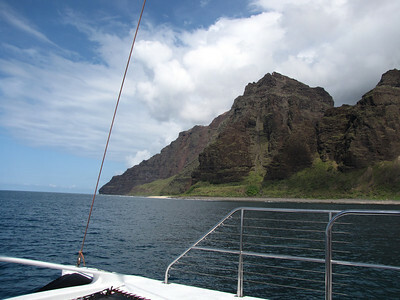 One of the waterfalls was included in the Jurassic Park movie–and the helicopter used is now owned by the Smith family who uses it for tours to the Forbidden Island–Lihauei–on the northwest side of Kauai. Here live about 200 native Hawaiian’s who speak Hawaiian as their first language and live without electricity or running water. Spinner dolphins accompanied us for a short time on our way north and a flying fish sailed for dozens of yards in front of us. On the way back we were priviledged to see whales spouting and then the baby whale breaching. Photos of rainbows and then of the sunset were taken and too soon we were back in the harbor, collecting our shoes and heading home. If you feel overwhelmed by the landscapes, I included only about a third of those that I took.